Support macOS 10.14 Mojave and iTunes 12.9. Fix part of the issue of failing to read iTunes Library. Support Lithuanian and Thai language. Support macOS 10.14 Mojave beta. Fix the conversion failure error on Mac OS X 10.10.5. Fix the problem of missing certain artworks. Add the pop-up window to prompt users to download iCloud files. Add the pop-up window to indicate the SIP settings to make the program convert music at up to 20X speed under Mac OS X 10.13 or above. Update English language package, and support Czech, Filipino, Greek, Korean, Russian, Slovak, Swedish, Turkish language. Fix the conversion failure and crash issue in some circumstance. Support macOS High Sierra 10.13 (limited to 1X speed to convert Apple Music). 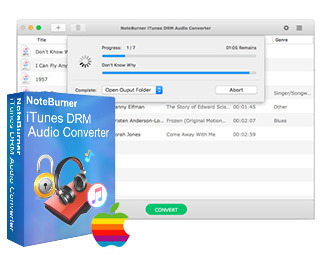 Support to convert audiobook at unbeatable fast speed. Support converting at 20X speed under iTunes 12.7. Support iTunes 12.7 (only support 1X conversion speed). Keep chapters when convert audiobook to AAC. Update some of the multilingual files. Fix the issue that the output audio has no sound or poor sound. Add the pop-up window to indicate the SIP settings to make the program work under iTunes 12.6. Fix the conversion failure issue in batch conversion. Fix the update error issue. Perfectly compatible with macOS Sierra. Retain disc number and composer in metadata. Add track number in output file name. Fix the no response problem when adding files in some circumstance. Improve the output AAC audio quality. Keep the output file listed in order. Support for new languages, including Italian, Dutch, Polish, Portuguese, Danish and Chinese Traditional. Fix the launching crash problem in some circumstance. Fix the conversion failure problem in some circumstance. Correct the Track Number in the output file. Support for new languages, including German, French, Japanese and Spanish.